At 8 pm EDT on June 20th, the Sun will be as far north as it can get from the celestial equator, marking the June solstice. On Friday, June 20, media outlets across North America willannounce that summer officially begins. Indeed, the point in the sky the sunreaches at 8:00 p.m. Eastern Time (5:00 p.m. Pacific Time) is still widelycalled the summer solstice. But inveighing against Northern Hemispherechauvinism, I prefer instead to refer to it as the "June Solstice." Many publications note that at the time of the JuneSolstice, for Northern Hemisphere localities, the days are longest and thenights shortest, but in the strictest sense this statement is only half true. 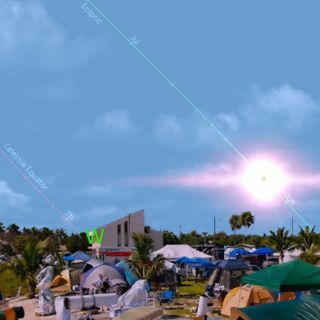 Asan example, from Philadelphia (latitude 40 degrees north), the sun on June 20will be above the horizon for 15 hours. But can we really refer to theremaining 9 hours as "night?" Not if we factor twilight into this equation. Certainly,after the sun disappears beyond the western horizon during the evening hours, thesky does not immediately become completely dark, nor is it totally dark untilthe moment that the sun emerges from the eastern horizon during the morning. Wecan thank our atmosphere for that. Twilight is defined as the diffused lightfrom the sky during the early evening or early morning when the sun is belowthe horizon and its light is refracted by the Earth's atmosphere. Civil twilight is defined to begin in the morning, and to end in theevening when the center of the sun is geometrically 6 degrees below the horizon(your clenched fist held at arm's length measures roughly 10 degrees in width),about 30 to 40 minutes before sunrise or after sunset. Civil twilight is thelimit at which illumination is sufficient, under good weather conditions, forterrestrial objects to be clearly distinguished. At the beginning of morningcivil twilight, or end of evening civil twilight, the horizon is clearlydefined and the very brightest stars and planets (such as Sirius, Jupiter and Venus) are visible undergood atmospheric conditions. In the morning before the beginning of civiltwilight, and in the evening after the end of civil twilight, artificialillumination is normally required to carry on ordinary outdoor activities. Nautical twilight is defined to beginin the morning, and to end in the evening, when the center of the sun isgeometrically 12 degrees below the horizon, about 60 to 80 minutes beforesunrise or after sunset. At the beginning or end of nautical twilight, undergood atmospheric conditions and in the absence of other illumination, generaloutlines of ground objects may be distinguishable, but most outdoor activities arenot possible, and the horizon is indistinct. Astronomical twilight is defined to beginin the morning, and to end in the evening when the center of the sun isgeometrically 18 degrees below the horizon, about 90 to 120 minutes beforesunrise or after sunset. Before the beginning of astronomical twilight in themorning and after the end of astronomical twilight in the evening the sun doesnot contribute to sky illumination. Admittedly, for a considerable intervalafter the beginning of morning twilight and before the end of evening twilight,any sky illumination is quite faint and somewhat difficult to perceive. Still,not until after astronomical twilight ends in the evening, or just before itbegins in the morning can we say that the sky is indeed totally dark. From Philadelphia, atthe June Solstice, the entire span of twilight lasts 2 hours and 2 minutesbefore sunrise and for a similar interval after sunset. So of the nine hoursthat the sun is below the horizon, it is totally dark for just 4 hours and 56minutes. And for every degreethat one goes north of latitude 40, the length of twilight increases by anaverage of almost 12 minutes. At latitude 48.7 degrees north, twilight lasts 3hours and 44 minutes, and north of there, twilight lingers through the entirenight. From London, England (latitude +51.5 degrees), twilight persists throughthe entire night from May 23 to July 18. From Edmonton, Alberta, Canada (latitude +53.6 degrees) it runs from May 13 through July 28. And at Reykjavik, Iceland (latitude +64.2 degrees), perpetual twilight runs from April 9through September 1. In fact, from May 20 through July 23, the sky remains sobright that few, if any bright stars or planets can be seen. Just a littlefarther to the north, lies the Arctic Circle, the southern extremity of the"midnight sun." North of theArctic Circle, the sun remains above the horizon for 24 continuous hours atleast once per year. Finally, in stark contrast to thesefar-northern locations stand the tropics, and those of you who might be heading south to those climesfor a vacation during the next few weeks will likely be struck as to how quicklydarkness falls after sundown. Indeed, from places like Honolulu or San Juan, twilight lasts about 90 minutes, and about an hour after sunset a good number ofstars will already be visible in the darkening sky.